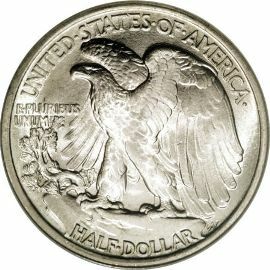 Walking Liberty Half Dollars were designed by Adolph A. Weinman and produced from 1916 to 1947. 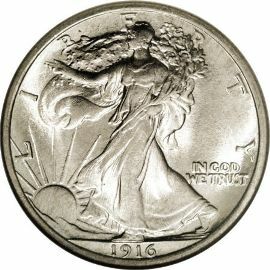 In 1916 the Dime, Quarter and Half Dollar designs were all due for a change, so Mint Director Robert W. Woolley selected three artists, apparently with the intention of awarding a different coin to each artist. Ironically, Weinman received honors for both the Dime and the Half Dollar. military glory. The word "LIBERTY" is in a semi-circle above the portrait, and "IN GOD WE TRUST" is located in the right field of the coin. The reverse depicts a majestic eagle perched on a mountain, wings unfolded in a pose that suggests power. A mountain pine sapling is growing from a rift in the rock next to the eagle. These strongly patriotic themes resonated perfectly across a nation then preparing to enter World War I.